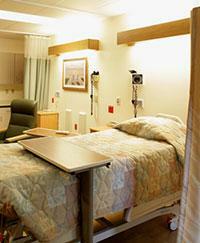 Our modernized Medical/Surgical unit was created with patient care and comfort as a priority. Our rooms are spacious, bright and contribute to the healing environment. Low patient to staff ratios allows our multidisciplinary team to provide high quality, individualized, and compassionate care. Patients, as well as their families, are encouraged to be active participants in the care they receive while in the hospital. Our goal is to get you well so you can return home to your family and friends. At Mason District Hospital we provide care of the highest level of dignity, professionalism, compassion, and kindness.